What's The Strangest Motorized Sport? We love motors. We love sports. We love motorsports. And of course, we’re always on the lookout for things that are strange and interesting, particularly if it’s a hilarious competition that we could enter or watch. Bizarre images of Auto Polo are making the rounds again, and it’s exactly what it sounds like: polo, but with cars instead of horses. While it may have included the first roll bars in history, it didn’t exactly look safe and was certainly bizarre. I’m a big fan of (and a semi-regular participant in) the 24 Hours of LeMons, which saves its highest prizes not for the winner of the race, but the worst car that finishes the best and provides the most amusement to all. It’s a party with a race going on, where your three-time Spec Whatever regional championship matters less than the fact that someone’s putting a dustbuster van on a race track, and that dustbuster van is awesome. Surely we’ve been outdone by rednecks with a spare lawnmower chassis and way too much spare time on their hands, though. And hey, competitive lawnmower racing is a thing! It’s so mainstream that Kimi Räikkönen’s even had a go at it, though. There must be more diabolical uses of double-digit horsepower, a course made out of mud, and ??? who knows, am I right? 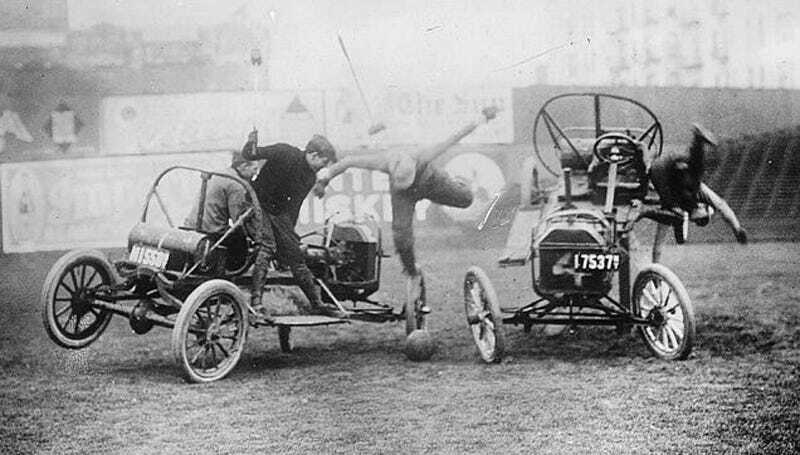 So, tell us: what’s the strangest motorized sport out there?